I bugged Mike to make me a real blog for months. But I didn't just want a real blog, I wanted it to perfectly match the scheme of my website. He did it! ...and then it took me a few more months to actually get around to setting it up. But here it is and here I am. I don't think I'm very good at blogging. Oh well. I'll just keep talking and maybe it'll get good enough that someone will listen. Summer's over and winter is coming. They're predicting our first snow this Saturday. I'm so excited! I love snow and so does the poodle. She'll spend hours zooming around in it....losing her mittens and collecting snowballs in her leg fur. However, despite all the fun we have here I still can't forget the many dogs who spend every hour of every day out in the snow...alone and freezing. There are so many dogs who are left chained in backyards no matter what the weather conditions. Many lack food and water as well. It's very popular nowadays to compare a dog with a wolf. I'm not an expert by any means but I simply can't follow those methods. The dogs we see nowadays are more human creations then they are wild creatures roaming the mountain valleys. Many of the more extreme animal rights groups out there want to release all pet animals into 'freedom'. 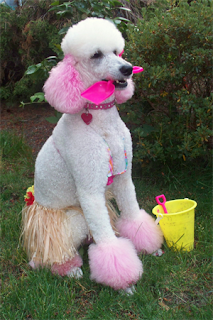 Can you imagine a Labradoodle out in the woods? Rubbing it's huge mats off on rocks maybe? Apparently they have not read the news articles about the stray Shih Tzu who's hair got so out of control that it became a prison shell that did not allow the dog to eat or walk. Even if I don't believe that there should be wild Chihuahua herds roaming the plains, I do believe that dogs are still pack animals. Even if we bred most of the 'wild' out of them, we DID encourage their dependence on us. That makes the existence of the dogs spending their entire lives chained even more depressing. This is even more astonishing now that we're in the era where dogs are less pets, and more family. Many clients at the vet where I work refer to themselves as their pet's 'parents' instead of their pet's owners. However, there are still a few that only bring their dogs in for once a year shave downs. The dogs arrive in horrible condition. One this year even had maggots. These dogs are 'outside' dogs. I'm not talking about animals that are farm dogs in charge of a herd of animals. Or even guard dogs on 24 hour duty. These are 'pets' that people 'love' and are left outside in a backyard to live a lonely life. All these dogs are aggressive, obese, and filthy. So, when you're outside enjoying the winter sports this year, please take a few minutes to remember those we have made dependent on us who are outside...alone and lonely. Find a local organization focused on helping these creatures and see how you can help as well. Maybe gather some neighbors to make simple dog houses to give out. Even donating a bag of food helps! It's been quite a busy couple of months! I am now Mrs. Jarrett and I couldn't be happier! I was only gone for a couple of weeks but the time off sent me back over a month at work! It's only now settling down but I'll be taking a bit more time off for personal reasons. Hopefully this doesn't conflict with too many people's schedules. The Go Dog, Go! Festival this year was amazing! There were over twice the vendors and definitely a lot more people. The only sad part is that Caly did not place in the costume contest this year! The same Briard that beat us last year but us again this year. Oh well! It just gives me an excuse to come up with an even more awesome costume next year! Hopefully some day soon we'll be updating my blog and moving it to an actual blog server to allow for publishing and comments. Keep stopping by! The site is coming along great! I think we just need to get the guestbook up and running to get some testimonials on here and then it'll be just about finished! I found out yesterday that the Kirkland Go Dog, Go! Festival is coming on July 24th this year from 10am-3pm. I mentioned it to my manager at VCA Bellevue and now we'll be having a table set up at the event! Our office manager and medical director will be managing it so please do stop by to get any questions answered and to pick up some reading material. Be sure to check out the webpage for all the awesome events that'll be happening. You'll even see a picture of Caly on it! Caly and I will be there again this year. I've already got a costume picked out for her and hopefully I have time to pull it off after the wedding. Cross your fingers that this year we get first! Last year Caly's Hot Rod costume took second. Nikki and I put a lot of work into it and I was happy to place. We were the only people to actually dye our dog. 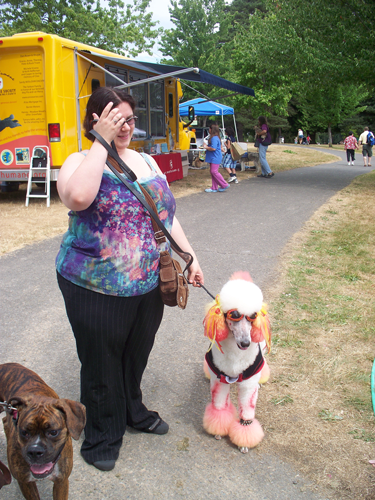 This year I'll be anticipating the heat and won't dress the poor poodle all in black! Getting this webpage up and running has been an interesting experience. I've been doing it all by myself (with a few tips from Mike) and so far things are coming along smoothly. I've never actually used a web publishing program before. All my past web pages have been dubiously slapped together messes of html that I found and copied from various sources on the web. They might have looked...alright... (not counting the fuzzy graphics and all black backgrounds) on the front, but behind the scenes they were a mess! This way is undoubtedly cleaner, easier, and I'm definitely happier with the end product. It is now less than a month until Mike and I run off to get married and less then two weeks until my bachelorette party in Vegas. Therefore, I will not be grooming on June 12th through the 14th or June 19th through July 7th. After July 7th I'll be back full time. In the meantime, my very good friend Shawn will be working part time to keep things running in my salon at VCA Bellevue. Everything for the wedding is planned and I'm working hard not to stress out about the last minute details. The weather up here in Seattle remains very, very wet and gloomy. Hopefully things are a bit sunnier down in California and it'll be nice and warm the day of the wedding! All images and content Copyright 2010 Amber Melena.